Kutná Hora was settled in 1142 with the establishment of Sedlec Abbey, the first Cistercian monastery in Bohemia. Just over a century later, German miners began prospecting for silver in the mountain region. Not surprisingly, Kutná Hora means mining mountain. In 1300, King Wenceslas II issued a royal mining code which specified the conditions necessary for operating the silver mines. He also claimed that everything two meters below ground belongs to the King. As the City was a favorite residence for Bohemian kings, Kutná Hora grew rapidly over the next hundred years. It became the second most important city in Bohemia behind Prague. Then came the outbreak of the Hussite Wars. In 1420, Emperor Sigismund attacked the Taborites, a subset of the Hussites in Kutná Hora. Though the Taborites won and prosperity continued for another 100 year, Kutná Hora was burned and ultimately struggled. After becoming part of the Hasburg Monarchy in 1526, the city suffered through a series of troubling events. In 1546, the richest silver mine flooded. Next, the city lost its privileges after an insurrection against Ferdinand I. In addition, it faced repeated epidemics of the plague and the ravages of the Thirty Year’s War. In 1770, Kutná Hora was devasted by fire. And finally, at the end of the 18th century, the silver mines were abandoned, and Kutná Hora met its demise. Currently, however, Kutná Hora has recovered from its checkered past and over the last 20 years the city has spent immense effort in restoring its historical treasures. The city’s historic center with the Church of St. Barbara along with the Cathedral of Assumption of Our Lady Sedlec are now UNESCO World Heritage Sites. 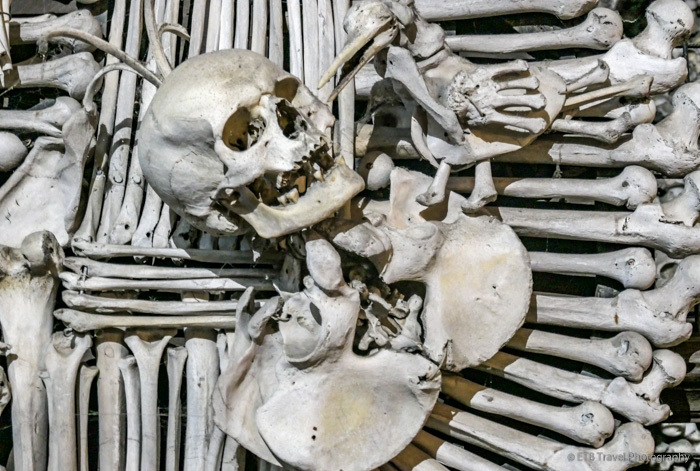 In addition to the above listed UNESCO World Heritage Sites, Kutná Hora’s close neighbor, Sedlec, is famous for the Sedlec Ossuary decorated in bones which attracts 300,000 visitors every year. The history of the Sedlec Ossuary begins in 1278 when Henry, the abbot of the Cistercian Monastery in Sedlec, was sent to the Holy Land by King Otakar II of Bohemia. He returned with a small amount of dirt from Golgotha, where Jesus was crucified, and sprinkled it over the abbey cemetery. Suddenly the cemetery in Sedlec was considered holy land and became a desirable burial site throughout Central Europe. Due to many deaths from the plague and the Hussite Wars, over 40,000 people were buried in the cemetery. In the 1400s, a Gothic church was built in the center of the cemetery. The church included an upper level as well as a lower chapel to be used as an ossuary. The ossuary stored the bones from the mass graves unearthed during construction. In 1511, a half-blind monk was assigned the task of stacking the bones and created six pyramids. More than 300 years later, the bones were arranged artistically as they are today. A local woodcarver, Frantisek Rindt, was hired by the noble Schwarzenberg family to decorate the chapel with the bones. While the exterior of the Sedlec Ossuary is unassuming, these fascinating bone decorations are what inspired me to take the side trip to Kutná Hora and the Sedlec Ossuary. I joined a tour simply because I didn’t want to have to figure out the public transportation which included two trains and a bus one way in order to see the city and the ossuary. This seemed a little daunting to me given there was only a 5-minute connection between the train from Prague and the local train in Kutná Hora. With any familiarity of the city and language, it isn’t hard to do, but I didn’t feel like being lost for any portion of the already abbreviated winter day. While having the freedom of my own time schedule would have been nice, I wouldn’t have learned nearly as much about the history of the places without joining a tour. Discover Prague offers the least expensive tour because it uses public transportation rather than a private bus to get from place to place. As such we were subject to a schedule and the tour didn’t meet until 11am which gave me some extra time to walk around Prague. Our group met near Old Town Square. After a long introduction, we walked 15 minutes to the train station where we waited another 20 minutes while our guide purchased the train tickets. I wish the tour pamphlet included this information as I could have purchased lunch in the train station while waiting rather than spending my free-time getting lunch at 10:30am. Regardless, soon we boarded the train to Kutná Hora, made the 5-minute connection to the local train, and ended up on the outskirts of Sedlec. Close to the local train stop is the Cathedral of Assumption of Our Lady Sedlec which was constructed between 1290-1320 as part of the Cistercians Sedlec Abbey. The abbey was burnt down during the Hussite Wars and the Gothic church was left in ruins for over two centuries. In 1700, the abbot of Sedlec Abbey, Jindřich Snopek, ordered the church be rebuilt. It was reconstructed in a Baroque Gothic style with unique features such as the Bohemian flat vault and a cantilever staircase. Now the church is a UNESCO World Heritage site. We walked by the church on the way to Sedlec Ossuary. As I mentioned above, the Sedlec Ossuary is decorated with 40,000 human bones! A chandelier made of at least one bone of every bone in the human body hangs in the middle. To the left is the family crest of the Schwarzenberg’s. Pyramids of bones fill three coves. Bone chalices fill in niches while skull and cross bones garlands hang from the ceiling. The detail is incredible. While it seems a little creepy to see human bone decorations, the people wanted to be buried on the “holy land” and now their bones bring people together to celebrate the church’s beauty. I have been a lot of places, and the Sedlec Ossuary is one of the most fascinating places I’ve seen. I could have stayed at there all day except that it was FREEZING cold and our tour had to continue. I highly recommend clicking on these pictures to see the details! Outside of the Ossuary we caught the bus to Kutná Hora. I would have never known this was the bus between Sedlec and Kutná Hora. It looked like a private tour bus! As such, I was happy to have a guide. The bus dropped us off at the Church of St. Barbara. The Roman Catholic church, named for the patron saint of miners, is one of the most famous Gothic churches in central Europe. The construction of the church lasted over 500 years between 1388 and 1905! Its progress was interrupted by the Hussite Wars and was largely dependent on the prosperity of the silver mines. Upstairs in its loft is a small museum with interpretative signs which shows how the church changed over the years. It was really cool to see all the different additions and changes in architecture. A few other points of interest include an intricately carved altar, miners’ coats of arms on the ceiling, a beautiful organ, and murals on the wall which represent the life of the miners in town. Just to the east of the entrance to the Church of St. Barbara is the Corpus Christi Chapel. At first glance, it just looks like a section of the surrounding wall. Instead, there is an empty, small chapel dating back to the 10th century! The roof of the chapel offers tremendous views of the town, hillside vineyards, and the valley below. Across the way from the church and the chapel stands the Jesuit College. The construction of the Jesuit College began after the Thirty Years War in the mid 1600’s. The Jesuits finally moved into its north wing in 1678 while construction on the rest of the building continued through 1750. Upon the abolition of the Jesuit Order in 1773, the building was turned over to the army to use as a barracks and military hospital. The army used the building until 1997, though in its later years the college was used as a warehouse. In 1998, the college came under the administration of the Czech Museum of Art. Now it houses the Gallery of the Central Bohemian Region. The terrace in front of the Jesuit College features Baroque statues from the early 1700s carved by sculptor František Baugut, a member of the Jesuit order. The statues depict the twelve Jesuit saints. The terrace, which came to be a portion of the Royal Road from the Church of St. Barbara to the Italian Court, resembles the Charles Bridge. We followed the royal road as we walked into town toward the Czech Museum of Silver which is housed in an old fortress. The museum offers two tours or a combo of both. Tour I features the geology of Kutná Hora’s ore district, archaeological relics, and the life of nobility in the area. Tour II teaches visitors about the mining process and minting of silver coins. We continued through the quaint town on the cobblestoned streets a few more blocks to Dačický Restaurant. The restaurant serves traditional Czech food along with unique dishes such as fish wrapped in 23 carat gold leaf. It is also popular beer hall which was voted best gastronomic in the Czech Republic. After our meal, we walked toward the train station but not before stopping near the Italian Court for a magnificent view of the Church of St. Barbara and the Jesuit College. In 1300, the Italian Court, so named for Italian minting experts, served as a royal residence as well as the Royal Mint. It became the central mint when King Wenceslas II ordered the centralization of all 17 mints take place in Kutná Hora. Along with the minting reformation, King Wenceslas II also ordered the minting of the Prague groshen, a uniform coin made of 90% silver and 10% copper. The silver for the coin came from the surrounding mines; the most productive mine being Osel which was the deepest in the world at 600 meters. Some 2500 tons of silver worth over $4 billion was mined in the area. The mining and the minting continued until the Hussite Wars when the mining was interrupted. The Prague groshen, however, continued to be minted though in less prosperous times the ratio of silver and copper changed. The mint shut finally down in 1727 after which the building was used for a variety of purposes including: regional mining offices, wheat storage, a military hospital, a cotton mill, a school and a prison. Over the years, the Italian Court suffered from fire and underwent many reconstructions to accommodate the different uses. Eventually the building fell into decay from neglected maintenance by the state. In the late 1800’s, the City of Kutná Hora purchased the Italian Court and restored it to its current state. The Italian Court now houses the town hall, a minting exhibition, a palace, an audience hall and chapel which may all be toured. Fascinating! And fabulous photos! Wish I had been there!